ActiveX Mattress by Nest Bedding Reviews - Is it a Scam or Legit? Inside the ActiveX Mattress by Nest Bedding are four different layers of memory foam that promise to help deliver a cooler, more comfortable night’s sleep. What is ActiveX Mattress by Nest Bedding? Promoted as the “coolest mattress on the market” and available in 3 vibrant colors, the ActiveX Mattress from Nest Bedding features several lab-proven technologies to help keep you cool at night. This includes a geometric top cover with thermic cooling performance fabric that allows you achieve a lower body temperature, along with sports performance styling and phase-changing Luma Gel Cooling Foam to help the bed breathe and keep the cool air flowing. Just because Nest tells us that ActiveX will help you sleep cooler at night, does this mean it’ll deliver once it’s in your bedroom? And even if Nest is a family-owned, organic, natural bedding company, does this mean they’re the best value for your money? Shopping for a new mattress isn’t easy, but by the end of this article, you’ll be armed with the information you need to make an informed decision about Nest’s ActiveX mattress. What Causes You to Sleep Hot? Since we spend about a third of our life sleeping, it’s easy to take for granted just how remarkable the process is. Without going off topic, though, from a physical perspective, sleep causes our body to enter a state of reduced consciousness, which also reduces our temperature and blood pressure. In contrast, our brain wave activity, breathing, and heart rate typically remains even. Specifically, our temperature drops 1-2°F while we sleep. But if this is the case, then why do some of us sweat like we’re at the gym while we sleep? As with most conditions, there can be multiple causes for excessive sleeping heat. For example, obvious factors like a home that’s too warm and bedding that’s too thick or otherwise doesn’t breathe properly can cause night sweats. Pro tip: One of the biggest consumer complaints related to traditional memory foam is that its thick, dense construction doesn’t allow proper airflow, which traps body heat and can result in an uncomfortable night’s sleep. Then there are medical conditions like menopause, certain cancers, hypoglycemia, hormone disorders, and neurological conditions. Medications—specifically some antidepressants, niacin, Viagra, and cortisone—can cause hot sleeping as well. In most cases, though, sleeping hot is just a personal factor. Just like some of us would wear a down coat in 50° weather while others of us would be outside in shorts and sandals, some of us simply sleep hotter than others. In general, this can be addressed by decreasing the temperature of your bedroom at night, which can be accomplished with a programmable thermostat. It’s also a good idea to increase airflow, whether using a fan or opening windows, while making sure your bedding isn’t too thick to allow proper heat exchange. With this in mind, how does Nest’s ActiveX mattress promise to help you sleep cooler? All foams featured in the ActiveX mattress are CertiPUR-US certified (no ozone depleters; no mercury, lead, or other heavy metals; no formaldehyde or phthalates, and low VOC) and are made in the USA with durable components that are built to last. Note: Nest tells us that you can sleep on your new mattress hours after you open it, although it can take 24-48 hours for it to expand to its full size. And although ActiveX comes with low VOCs, there might be some residual smell for a few days. Nest also uses hydrated silica (a naturally occurring element found in toothpaste) for their fire barrier, which avoids using chemicals like PBDEs, TDCPP, or TCEP. According to Nest, the ActiveX mattress must be used on a breathable, non-flexible base, such as a newer style box spring foundation or adjustable base. It can also be placed on a non-flexible slatted base, as long as the slats are no more than 4” apart. With this in mind, Nest specifically notes that the following bases are not acceptable: on the floor, older style flexible box springs, slats that are flexible or bowed, or again, slats that are more than 4” apart. Like most memory foam mattresses, ActiveX is dust mite resistant and mold resistant if kept dry. Something we frequently reference in our mattress reviews is that, based on what we learned in Mattress Buying Part I, the difference between many of these online-only companies often comes down to marketing angle. In this respect, what’s up with ActiveX’s various technologies? What does “sports performance design” actually mean? What, exactly, is a “thermic cooling fabric”? In what way has it been proven to help you fall asleep faster and stay in deep sleep longer? Physically, how does the Luma Cooling Foam “help the bed breathe and keep the cool air flowing”? Are the lab results available showing it’s proven to help dissipate heat and keep you cool? We do know that proprietary Energex Foam claims to provide all the advantages of viscoelastic memory foam, but without the slow recovery. We’re also told it doesn’t absorb heat like most memory foam. Further, convoluted foam (it has grooves and channels, usually only on one side) helps aid in breathability, although it’s certainly not something unique to ActiveX or Nest. The same can be said of phase change fabric, a technology that allows body heat to be absorbed and stored in the mattresses’ cover and to help improve temperature regulation. Bottom line: Do these amount to technologies amount to anything that’s meaningfully different than the competition—and that will deliver a cooler night’s sleep—or do they just amount to buzzwords? We reached out to the company regarding these questions, and we'll be sure to update this article as soon as a response is received. Does Nest Manufacture Other Bedding Products? In addition to the ActiveX cool-sleeping mattress, Nest offers a complete line of other complementary bedding products like pillows, sheets, comforters, mattress and pillow protectors, blankets, toppers, foundations (bases, frames, and platforms), and even candles. Alexander Signature Series: $899 - $1,499 – An affordable four-layer alternative to higher-priced memory foam models that features SmartFlow Air Flow Foam and Thermic Phase Change Cooling Fabric for cool sleeping. Hybrid model combines memory foam and pocket coils. Love & Sleep: $399 - $749 – A three-layer mattress that promises to deliver cooling comfort at an unbeatable price. The Smarthouse Collection: $1,599 - $2,099 – A breathable, natural, three-layer mattress “from the heart of” Amy Smart and Carter Oosterhouse with convenient handles on the sides and a wool-filled quilted top layer. Available in firm or plush. Handmade in Michigan. Natural Latex Collection: $1,199 - $3,999 – The Hybrid Latex model features a bottom layer of 1,100 individually wrapped coil units, topped by firm or medium natural latex. The Graphite Latex model is completely vegan, with 8” of Graphite Latex (Dunlop Process) and a certified organic cotton cover. BKB (Big Kid Bed) Mattresses: $299 - $499 – Billed as the first mattress in a box solution for kids, the BKB features 5” 1.8 lb density Edge Support Base Foam, 2” of breathable, supportive 2.8 density Energex Foam, CertiPUR-US certified foams, and no chemical fire barriers or toxins. Comparatively, what will you pay for an ActiveX mattress? How Much Does Nest’s ActiveX Mattress Cost? Like many other online mattress companies, Nest offers financing between 0% and 30% APR for 6 months through Affirm. ActiveX mattresses come with free shipping and will arrive compressed into a box about 18” x 18” x 48” weighing between 100 and 150lbs. If you live within a certain distance of Nest’s San Francisco, Berkeley/Albany, Palo Alto, Studio City, New York, and Santa Monica retail locations, same day deliver may be available. All Nest mattresses come with a 100-night free trial, although you’ll need to sleep on it for at least 30 nights before requesting a return. Keep in mind that the only valid reason for a return is a comfort issue. (c) coil failure (extends or depresses more than 1” of original height or protrudes out of the mattress core). In order to request a return or process a warranty claim, you’ll need to email Nest at customerservice@nestbedding.com for return authorization. Support can also be reached at 888-435-6943. 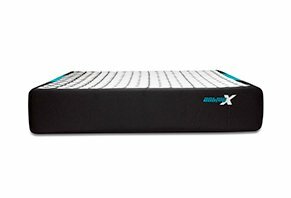 Are There Any Customer Reviews for Nest’s ActiveX Mattress? Nest released ActiveX on 10/27/16, so there was very little online customer feedback specifically for this model at the time of our research—including on the Nest website. From a professional perspective, Sleepopolis reviewed the ActiveX mattress and gave it an overall rating of 4.8 (out of 5) stars. He noted that the diamond pattern on the cover was one of the most unique he’d seen to date and put the firmness somewhere around a 6.5-7. As far as feel, he noted that ActiveX provided a little less sinkage and more of floating feel compared to most online foam mattresses, with good pressure relief and nice bounce from the Energex foam. Although he felt ActiveX was a bit too firm for side sleeping, at 140 pounds, he made sure to point out that if you're of average or above average weight, you'll be less likely to encounter this. In the end, the reviewer found ActiveX to provide comfortable cooling, an aligned spine, and an extremely supportive feel, without taking away any comfort. Nest’s other mattresses—especially their popular Alexander and Love Bed models—seem to come with similarly high feedback from customers and professionals alike, including Yelp, Sleep Sherpa (who called the Alexander “one of their favorites”), and Mattress Clarity. Breaking from traditional marketing channels, Joe Alexander, Nest’s founder, recently partnered with Airbnb to send out 1,000 free mattresses to different rentals around the US. In turn, owners can earn $50 for every referral they send. How Does Nest’s ActiveX Mattress Compare? The long and short of it is that if you’re in the market for an online-only mattress, there are so many different options that it’s easy to come down with a bad case of analysis paralysis. This includes popular memory foam options like Casper, Tuft and Needle, Novosbed, Leesa, Bear (who also features a performance-focused fabric for active individuals) and Lull. Even the big name manufacturers have entered the online arena with options like Cocoon by Sealy and Tempur-Pedic. Typically, we provide a table comparing each of these options from four different aspects; price, number/types of layers, trial period, and warranty. But you know what? 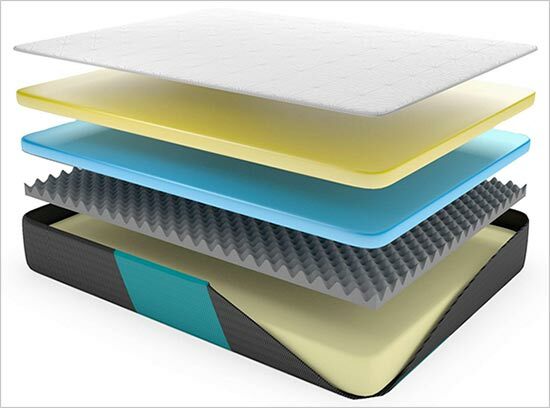 The reality is that when you boil all of these options down, you’re really only looking at two meaningful differences between them: 1) The number of memory foam layers (typically between two and four) they contain and 2) their price. In other words, most of them fall between a 6 and 7 on the firmness scale, arrive at your door compressed into a manageable-sized box, feature extensive trials and warranty periods, and claim to help you sleep better in one way or another. Like ActiveX, many of these competitors specifically promise to help you sleep cooler. From a price perspective, ActiveX is meaningfully higher than low-cost options like Eve, Tuft and Needle, Casper, Leesa, Lull, and Cocoon, although it’s certainly competitive with models from Yogabed, Novosbed, and Sapira. Pro tip: Compared to much of the competition, another meaningful difference is that ActiveX isn’t quite as flexible when it comes to bases. Many other online-only models can be used with any base, including on the floor. In fact, using your ActiveX mattress on an improper base could void your warranty. Is ActiveX the Right Mattress for You? Will ActiveX’s competitive price and specific combination of memory foam help you sleep better? Because getting a good night’s sleep is such a personal process, based on hundreds of meaningful factors, there’s no way to know without giving one a try. Fortunately, you can take advantage of the company’s 100-night trial to gauge whether or not it suits you. Just keep in mind that you might want to keep your old mattress around in case Nest doesn’t work out. Otherwise, you could end up sleeping on the floor until your replacement arrives! In addition, while online feedback for ActiveX is limited, professional sites seem to give the company’s other mattresses very high marks. Obviously, this doesn’t mean you’re sure to experience the same with ActiveX, although it’s certainly a positive direction. Did you experience a cooler night’s sleep with Nest’s ActiveX mattress? Why or why not? Help other potential customers make a more empowered decision by writing your review below! Write a Review for ActiveX Mattress by Nest Bedding!